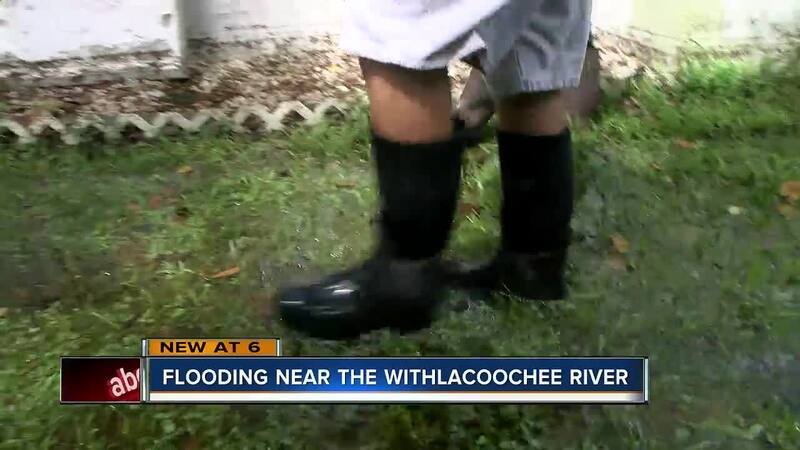 SUMTER COUNTY, Fla. — Neighborhoods in the Croom-A-Coochee area are dealing with flooding, and this might not be the worst of it — an alert has been issued for rising water on the Withlacoochee River, cresting near minor flood stage in the next few days. For the last few days, Walter Jenkins’ routine has been the same, using his neighbors' pump to get water out of his yard. "Everything was under water," said Jenkins. The water came rushing in after heavy rain on Friday in the Croom-A-Coochee area of Sumter County. Jenkins says the water was just inches from entering his home. "I was getting scared I thought we were going to have to take everybody out of the house," Jenkins said. Neighbor Edward DeWolf says in more than 30 years, he’s never seen anything like it. Though they live close to the Withlacoochee, forecasters say the water is likely coming from the heavy rain, not the river. "It's in God's hands, there isn't much you can do," said DeWolf. The ground is completely saturated with nowhere for the water to go and just down the road, it was much worse. Dan Masturzo's entire yard is still covered in feet of water. "I call it Lake Dan," said Masturzo. He jokes about finally having waterfront property. "People pay good money to get property like this, haha," said Masturzo. A little humor and good neighbors are how they’re all getting through the frustration of the flood. "Neighbors helping neighbors, that’s what its all about," said DeWolf.